Ted Becker, Ph.D. & Rod Havriluk, Ph.D.
As mechanical advantage increases with both shoulder extension and elbow flexion during the beginning of the butterfly pull, it was hypothesized that hand force would significantly increase with two events: 1) when the hands first submerge below the level of the shoulders and 2) when elbow flexion begins. 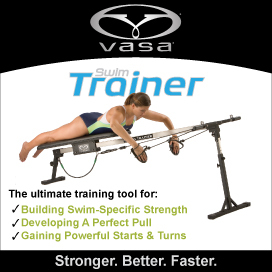 Female swimmers (n = 23) from three university teams were tested with Aquanex+Video swimming butterfly over a 20 m course. As hypothesized, there was a significant (p<.01) increase in force for both events, emphasizing the importance of a mechanically advantageous angle at both the shoulder and elbow. Based on the quantitative results, coaches can qualitatively evaluate swimmers to ensure they eliminate the wasted time that their hands are above the shoulders and begin elbow flexion as soon as the arm entry is complete.